Graduate Charles Ford III chose Florida State University because he wanted a high-quality education surrounded by a strong community atmosphere. “What drew me to FSU is that you can feel the importance of community the minute you stroll down Legacy Walk,” Ford said. Ford, the first in his family to attend college has dreams of becoming a physician. When looking for a college, he needed a school with a supportive environment and elite faculty and staff. 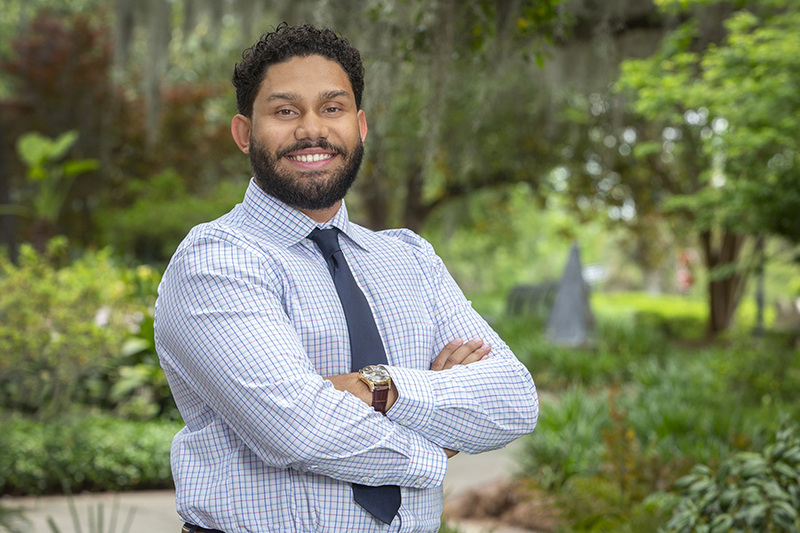 The native of Tampa, Florida, took the challenging path of double majoring in biology and psychology because it encompassed his love of science and helped him on his journey to medical school. “I want to become a physician because it is a lifelong career dedicated to the interactions and gratification of the human experience, and I want to impact lives,” Ford said. Ford was very involved with research from the get-go. He worked with professors James Olcese and David Meckes at the FSU College of Medicine researching the relationship between exosomes, transgenic Alzheimer’s mice and their role in the development of Alzheimer’s disease and memory loss. Ford’s work in the lab led to him being one of the contributing authors, along with Meckes, to an article entitled “An optimized method for purification of whole brain-derived extracellular vesicles reveals insight into neurodegenerative processes in a mouse model of Alzheimer’s disease,” which was recently accepted for publication in the Journal of Neuroscience Methods. In summer 2017, Ford got the opportunity to travel and take his medical studies abroad after receiving a Benjamin A. Gilman International Scholarship through the FSU Global Scholars program. He spent nine weeks on a service-learning trip to Ghana, where he interned at a medical facility helping people in the local community. Ford worked with the non-government organization, Humanity and Community Development Projects Ghana. During the trip, he raised $500 to conduct health screenings, eye exams and purchase glasses and medicine for a village community. He worked in various medical wards in the Volta Regional Hospital of Ghana, conducting ethnographic research in two village communities and touring the Volta Region of Ghana. Ford has also been heavily involved in helping those in need at the local level. He accumulated more than 700 volunteer hours on campus and in the Tallahassee community. Ford worked with organizations like the Southern Scholarship Foundation, Tallahassee Memorial HealthCare’s Adult Day Care Center, the FSU Medical Response Unit, HCDP Ghana, the Alzheimer’s Project, FSU USSTRIDE and the FSU Pre-Medical American Medical Student Association. Ford’s fondest memories were during the two years he was a proud member of the world-renowned FSU Marching Chiefs. Ford was selected as a semifinalist for a Fulbright Scholarship to study in the United Kingdom but unfortunately was not selected as a finalist. Now that he has graduated, Ford will enroll at the University of South Florida in the fall and work toward a master’s in public health on the path to becoming a specialized physician.